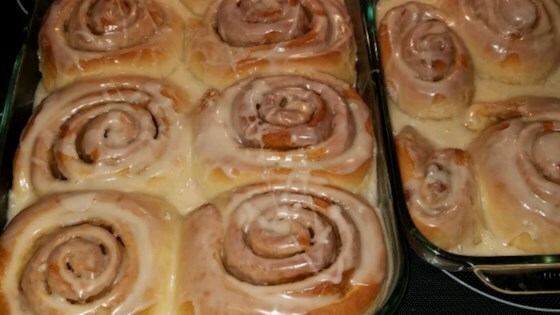 "I watched mom make these rolls when I was young and have always loved how easy they are to make!" In a large mixing bowl, dissolve yeast and 1/3 cup sugar in warm water. Stir in salt and 2 cups flour. Beat mixture for 2 minutes. Beat in eggs and oil. Stir in the remaining flour, 1/2 cup at a time, beating well after each addition. When the dough has pulled together, turn it out onto a lightly floured surface and knead until smooth and elastic, about 5 minutes. Lightly oil a large bowl, place the dough in the bowl and turn to coat with oil. Cover with a damp cloth and let rise in a warm place until doubled in volume, about 40 minutes. In a small bowl, stir together 1/2 cup sugar and 2 teaspoons cinnamon; set aside. Divide the dough into twelve equal pieces. Take each piece of dough, roll into a log and roll in cinnamon sugar mixture. Place the knots in a lightly greased 9x13 inch baking pan. Cover the rolls with a damp cloth and let rise until doubled in volume, about 40 minutes. Meanwhile, preheat oven to 350 degrees F (175 degrees C).